When I visited the Crazy Quilters guild earlier this month for my Visual Language of Quilting presentation, I brought along this quilt as part of my trunk show. (It has lots of quilted feather designs on it.) However, I noticed it did not have a label because it was still without a name. Having a captive audience of experienced quilters and creative thinkers, I asked for assistance on giving this pretty quilt a name. Here are their suggestions: Pansies out Pat's Window, Asian Feathers and Flowers, Forest Pansy, Purple Pansies for Pat, Feathers for Pat, Fancy Pansies for Pat, Pansies at Pat's Window, Pansies in the Grass with Diamonds, Pansies Four, Pretty Pansies for Pat, A Rich Relationship, Pansies on Point, Feathers, Flowers and Fun, Box of Pansies, Pat's Poppin' Poppies, Flower Beds, A Walk through Pat's Garden. Other suggestions include: Flowering Treasures, Happy Pansies, Flower Boxes, and Birthday Bouquet. 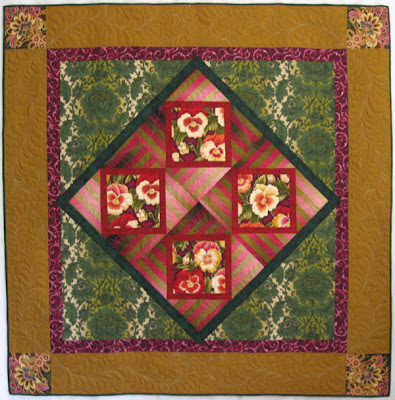 Thanks, Crazy Quilters, for your wonderful ideas and suggestions! I will press the owner of this quilt to make the final decision... and I'll get that label attached. After all, I should practice what I preach: "Document your quilts! Make and attach a label." Hey Veronica! Glad to find your blog. Do you have an e-mail address where I could ask you some questions about your former quilt shop? I took some classes there. Mine is wbmarsh25@yahoo.com. Thanks! Brooke: the e-mail address you left bounces messages. You can contact me at veronicaquilts@gmail.com.